Each photo is the culmination of thousands of little choices, from what aperture setting to use in direct sunlight, to how dirty to keep the UV filter for more interesting flares, to what you want the light & colors to be doing when you're done. Here's a quick little before & after that focuses on the latter, revealing a few of the decisions that went into a rather touristy shot i took last weekend. 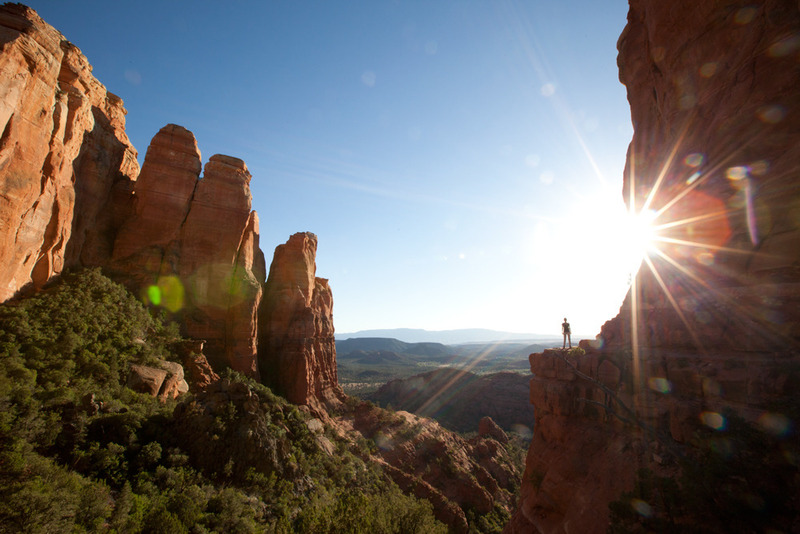 Yup, that's Cathedral Rock in Sedona, Arizona, a really great hike if you've never been on it. I'm sure a whole heck load of people stood where i stood and released the kraken.. err..uh shutter, which is appropriate because it's just so darn pulchritudinous up there, especially at sunset. Goodbye Windows '98 blue sky. I was going for something more antique looking, so i added some green to the highlights, and red to the shadows. My first digital camera's sensor used to freak out in direct sunlight, producing these really great magenta aberrations in the blown-out areas. Consider it both an ode to crappy optics, and light leaks on color film. All this red... we need something to balance it out a little. More green in the foreground, and more blue in the distance. It's subtle, but important. Takes the zang out of the red rocks which would have been blinding if i had left them alone with all the other color adjustments. What's really cool about a texture layer is how the image below it inherits its color and luminosity variances, in this case, really helping what used to be a boring, cloudless sky. For this example, i dipped into the store of texture shots i've taken over the years, and pulled out a nice one of the blackboard i have in my kitchen. Some of the white spots you see in the flares in the sky are actually flecks of chalk i used as focal aids.